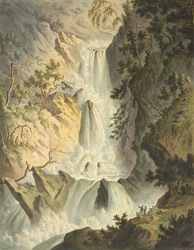 View of the Devil’s Bridge Waterfall. The bridge, which cannot be seen in this painting crosses the falls of the River Mynach at the point where they meet the River Rheidol. Located in the foothills of the Pumlumon mountain range this beautiful and dramatic setting is twelve miles from Aberystwyth. There are actually three bridges over the falls the first of which was built in the 11th century by either the Knights Templar or the Cistercian monks of Strata Florida to help pilgrims journeying to St David’s. The Welsh name for the falls is Monk’s Bridge in tribute to this bridge. The English name refers to a legend which holds that the Devil built the bridge in return for the soul of the first person to cross it. However bread was thrown across the bridge and dogs ran after it thwarting the Devil’s plan.